Pastured chickens make the tastiest, healthiest broth. One advantage of buying a whole chicken is the bones. While making free Monday night deliveries, I was regularly reminded by customers why they were buying our meat: they wanted the healthy bones of pastured birds as well. Such bones are often seen as inconvenient waste and we’ve become accustomed to buying deboned cuts of poultry in the supermarket. But as more people eat fewer fresh bone broths, they are missing out on an ancient source of nutrition. People are rediscovering the benefits of cooking bones into soups and broths. Research is demonstrating how amino acids and other nutrients, valuable to our health, are found in the whole bird. Some believe that the lack of whole animal foods is a reason why more people suffer from food allergies. The experience of many is that broth cooked with bones, skin and other parts tastes much better. 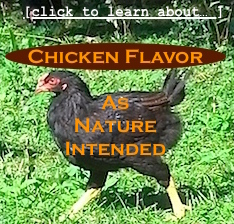 If you want maximum flavor and nutrition, pastured chicken is apparently the richest. Cayuta Sun Farm still has whole chickens for sale. They are an old heritage meat breed called Dark Cornish. Free delivery will continue on Monday nights in Schuyler and Tompkins counties.